Kuwait is set to launch 20 major development projects worth KD21.7 billion ($71.6 billion), including a railway network project and waste management plant, as part of its 2018-2019 development plan, said a report. Of these projects, Kuwait’s massive hydrocarbon sector has the lion’s share with a value of KD11.9 billion, accounting for nearly 55 per cent of the total, reported local Arabic language daily Al Nahar. The oil sector’s projects include the multi-billion-dollar Al-Zour refinery in South Kuwait, the clean fuel project which involves upgrading Kuwait’s two main refineries, and a large petrochemical complex near Al Zour refinery, stated the report, citing a government report. The transport sector is the second largest beneficiary with five projects with a combined value of KD4.49 billion, including Kuwait’s international airport expansion, it said. Four projects in the plan are joint public-private ventures sponsored by the Kuwait Authority for Partnership Projects including a rail network project, Al Jahra labour city and Kabd solid waste management plant, it added. However, the total value of awarded projects in Kuwait fell by 28 per cent KD4 billion ($13.3 billion) in 2017 as compared to the previous year and below the five-year average of KD5 billion, said NBK in its latest Economic Update. The surge in contracts in the power and water sectors–compared to prior years–was more than offset by the slowdown in projects in other sectors, mainly transport and construction, the Update added, citing a Meed Projects report. For 2018, the value of contracts is expected to remain at about its 2017 level with the largest contribution coming from the construction sector. Due to delays in the bidding phase in 2017, many construction projects (KD2 billion) have been pushed out to 2018. Also, some delays in awarding transport projects, valued at up to KD0.7 billion, could also take place this year. Projects in the water sector reached a record KD0.9 billion in 2017. The Umm Al-Hayman wastewater treatment plant expansion, one of five projects awarded for the sector, accounted for most of the sector’s KD0.9 billion. This project, which was awarded to a consortium of WTE Wassertechnik and International Financial Advisors, will be funded through a public private partnership (PPP). Although the cancellation of the Al-Zour North IWPP was a setback for the power and water sector–and the public-private endeavour as a whole–the second phase is planned to be integrated with the third phase of Al-Zour North. There are still no further developments on the Khairan IWPP, which was awaiting the progress on Al-Zour North 2. Contracts in the power sector amounted to KD502 million, but there was a delay of the Kabd waste-to-energy PPP project. The Kabd municipal solid waste project was awarded to a consortium led by France’s Constructions industrielles de la Méditerranée–that bid KD236 million–in September 2017. However, Kuwait’s State Audit Bureau (SAB) rejected the tender–based on the documents submitted–delaying the project to 2018, provided that requirements by SAB are fulfilled. For 2018, up to KD650 million in power sector contracts are expected to be awarded. Among them is the Al-Dibdibah solar PV power plant in the upcoming Shagaya renewable energy complex. In line with the development plan goals, the Kuwait National Petroleum Company (KNPC) has tendered this project, hoping to contribute to the goal of solar energy providing 15 per cent of the electricity demand in Kuwait by 2030. Activity in the oil sector picked up to KD1.1 billion worth of projects in 2017. Of the fifteen contracts awarded in 2017, three major projects are noteworthy: (i) Kuwait Oil Company’s (KOC) KD390 contract for a gathering centre at Burgan Field, that was awarded to British oilfield services provider Petrofac; (ii) the New Refinery Feed Pipeline project, awarded to Italy’s Saipem in a deal worth KD255 million; and (iii) a crude transit pipeline from North Kuwait to Al-Ahmadi’s central mixing manifold, awarded to Indian contractor Larsen & Toubro (KD113 million). Gas sector awards eased in 2017 following significant activities in prior years, and are expected to remain relatively modest in 2018.The gas sector took a back seat in award activity in 2017 after a stellar performance in the prior two years. Two deals were signed in 2017, worth KD96 million, a lacklustre performance after the boost of KD1.3 billion in deals in each of 2015 and 2016. In terms of upcoming projects, both the oil and gas sectors are expected to witness subdued activity (KD620 million) in 2018. Activity in the transport sector declined in 2017 following a strong performance in 2016, mainly on account of delays. A total of 15 transport sector deals (KD0.8 billion) were awarded in 2017. 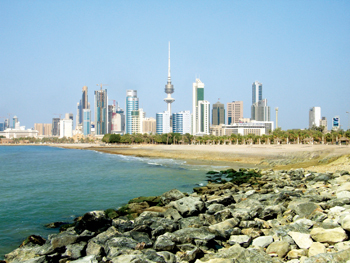 The largest deal was an infrastructure works contract for the South Al-Mutlaa City, valued at KD212 million. Another significant project was the runway and taxiway project for the first phase of the Kuwait Airport Expansion project at KD147 million. The Central Tenders Committee postponed awarding a contract related to road and crossroad construction in the South Al-Mutlaa area. The lowest bidder, a team of Ali Al-Kharafi& Brothers and Metallurgical Corporation of China, was not able to raise the required bank guarantee (bid worth KD85 million). Meed reports that a team comprising of Turkey’s Makyol and Kuwait’s Contec United General Contracting could win the contract, offering the second lowest bid at KD109 million. Looking forward, up to KD700 million in transport contracts are expected over the next few quarters. The Ministry of Public Works (MPW) and Public Authority for Housing Welfare (PAHW), have six contracts currently in the bidding phase, in addition to three other contracts from various government entities. Several contracts are related to the northern and southern sections of the regional road, and roads at South Al-Mutlaa. Despite a higher number of contracts, the total value of construction awards eased in 2017 to KD0.5 billion. Over thirty contracts were awarded in the construction sector, but given the small size of these contracts (only three are worth over KD30 million), their value fell short of the 21 contracts awarded in 2016 (total value of KD1.2 billion). The construction sector is expected to dominate projects in 2018 and could reach up to KD2 billion. There are 26 anticipated deals under consideration, of which the Jahra Ministries Complex valued at KD260 million could be awarded in the first half of 2018. Meed Projects reports that the lowest bidder is United Gulf Construction Co., and it is very likely it will be awarded the tender. This project was pushed to 2018 due to budgetary constraints. The other noteworthy project that is expected in 2018 is the Kuwait National Guard’s Kazema Camp project estimated at KD300 million.